Claiborne Avenue Relaxing. Claiborne Avenue, New Orleans. Near Circle Foods, pre-Katrina. Photography by Derek Bridges, c.2001-2002. Wikimedia Commons. Creative Commons license. The Voice Of The Wetlands Allstars - New Orleans Jazz & Heritage Festival 2012. Takahiro Kyono, 2012. Wikimedia Commons. Creative Commons license. 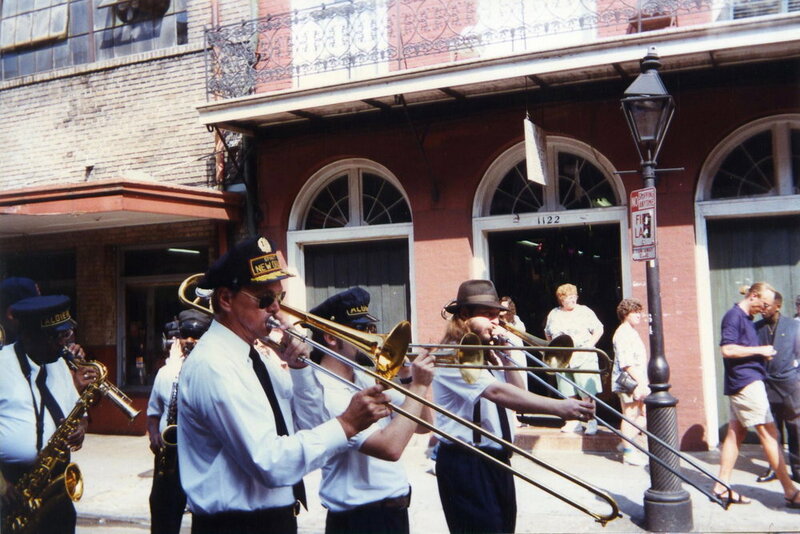 Pud Brown's "Jazz funeral", New Orleans. Layton Martens, Andy Galbiati, Mike Owen on trombones Photo by Infrogmation, 1996. Wikimedia Commons. Creative Commons license. Ashana Bigard is life-long resident of New Orleans and long-time advocate for the health and wellness needs of children and families in Louisiana, working with a diverse range of youth, education, and juvenile justice-based organizations. Robert C. Tannen is multi-disciplinary artist, educator, and regional planner for research and development, architectural, and civil engineering firms. “[...] Creolization is part of the cultural continuity of community life and recreation of the social order—especially in the face of social and economic pressures or natural and unnatural catastrophes. In a broader sense this perspective views the relationship between the conservation and transformation of cultures we find symbolized in expressive forms as a potentially universal creative process. The results of continuous co-mingling and adaptation of traditions to one another may produce continuities from past to present and ultimately future cultural arrangements where national or global outcomes may vie with local needs. —Nick Spitzer, “Creolization as Cultural Continuity and Creativity in Postdiluvian New Orleans and Beyond”, Southern Spaces, November 28, 2011.